Crockpot Creamy Chicken Noodles - Just 5 minutes prep! 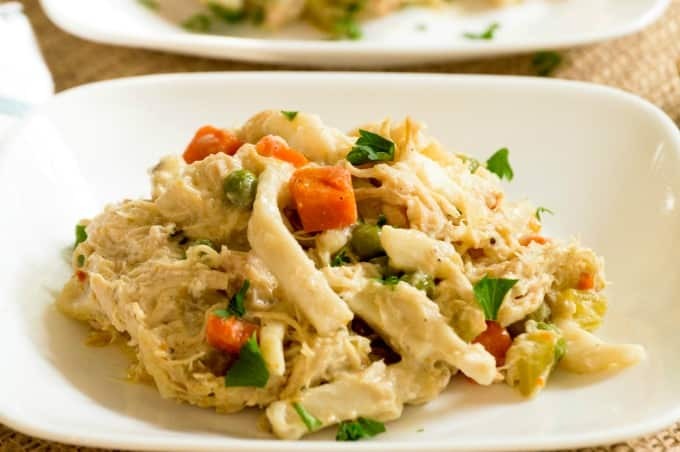 This Crockpot Creamy Chicken Noodles Recipe is comfort food at its finest! 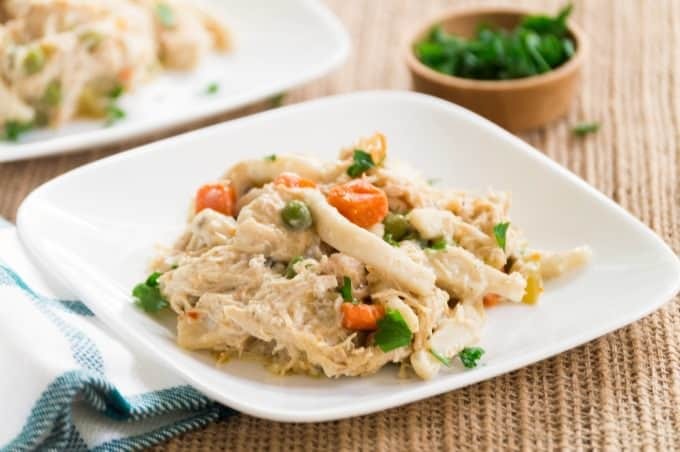 Featuring tender chicken, bites of peas and carrots, and slurpy noodles in a creamy sauce, it’s a meal your family will ask for time and again. I love crockpot recipes, especially this time of year. There’s just something wonderful about walking in the door after a long day and smelling something delicious bubbling away in the slow cooker. Finding crockpot recipes without “cream of this” or “cream of that” soup isn’t easy! I’m not a fan of canned soups due to their sodium content, not to mention how many are using high fructose corn syrup which is something we try to avoid. So, when coming up with this recipe, I wanted to get that creaminess without opening a can of goop. This does it! 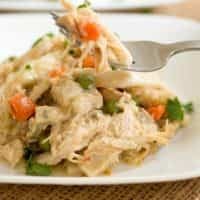 To make Crockpot Creamy Chicken Noodles, all you do is chop your vegetables and scatter them on the bottom of the crockpot. Add the broth and seasonings then top it all with three boneless, skinless chicken breasts. Cook it on LOW for 6 hours (or HIGH for 3) and gently shred the chicken with two forks. Stir in 4 oz. of cream cheese, and 2 cups of frozen egg noodles. Cook on LOW for 1 more hour and, boom, dinner’s served! 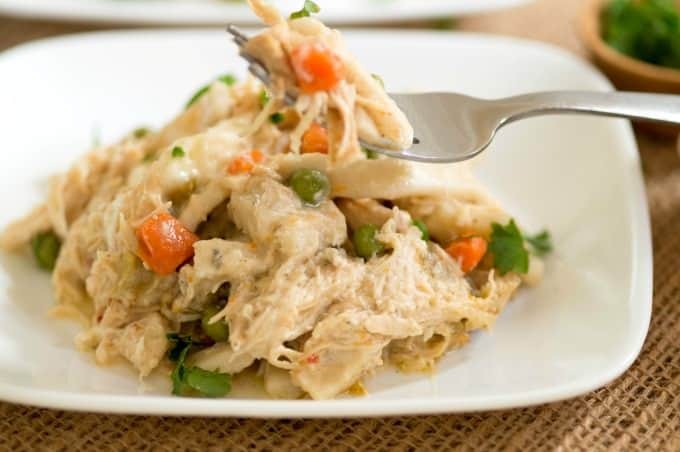 Crockpot Creamy Chicken Noodles keep well in the refrigerator for up to 5 days in an air-tight container. Just minutes to prepare, this delicious slow-cooker dinner is comfort food your family will love! Add the carrots, celery, peas, onions, pepper, sage, and chicken broth to the crockpot. Top with the chicken breasts. Cook on LOW for 6 hours or HIGH for 3 hours. Gently shred the chicken with a fork. Stir in the cream cheese and frozen egg noodles. Cook on LOW for 1 hour. Stir and serve. Garnish with minced parsley if desired. It is not necessary to defrost ingredients prior to cooking -- except the chicken! This was really tasty – and it fed me (no kids!) for the entire work week… hooray! Mine definitely did not come out looking very pretty like your pictures did, but the deliciousness was there 🙂 I also added a lot more carrots and celery since I had them around. Definitely plan on making this again soon, thanks for sharing! I’ve found that I can cook chicken in the crock pot for 3 hours or less (under 8 servings) on LOW and it cooks all the way through without that crock pot dry chicken effect – otherwise I followed your instructions to the T! Thank you for posting this recipe! I have been searching for recipes for the crock pot that didn’t involve canned soups because of the sodium content! I’m glad you found it! I’m not a fan of canned soups for a variety of reasons. You might like my Crockpot Bacon Cheeseburger Soup, too! This looks so delicious! I love creamy chicken dishes – and this one looks like it’s easy to make, too. Thanks for sharing! This will be a very special comfort dish! Hope you have a great weekend and thanks so much for sharing your post with us at Full Plate Thursday! This looks really good! Eager to try it as a casserole instead of the traditional “pie”. Visiting from Oh My Heartsie Girls party.